Wasps and hornet stings can be very serious! Andy’s Pest Control has specialized equipment to eliminate nests no matter where they are located on your home. Our service include treating and removing the nest if exposed. We will also apply a residual spray so no future wasps will take over the area. Do you have wasps entering your home through a crack or crevice? STOP – do not seal up the entry point until you know for sure the nest is dead. Andy’s Pest Control uses a dust and residual combination to make sure any wasps coming or going from the nest will make contact with the insecticide and die. 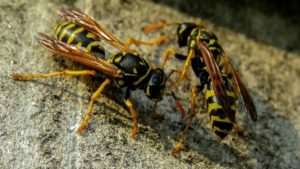 Whether you have umbrella wasps, yellow jackets, or bald faced hornets Andy’s Pest Control can do same day service giving you peace of mind knowing they are no longer causing anymore stress to you, your family and your home. Wasps in your siding or brick? A common call we get for wasps is when the nest is built inside a wall void of your home. Many customers have tried over the counter measures with no luck. We use professional grade dusts that get injected into the wall void and completely covers all areas of the void ensuring wasps have no choice but to make contact with the dust. 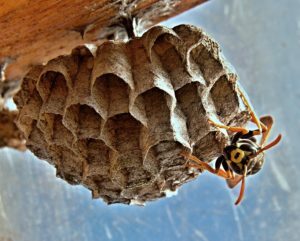 This method ensures that any wasps that are out foraging for food or nesting material will return to the point of entry will still make contact with the insecticide. If you or a family member is allergic to wasp or hornet stings, please give us a call! We offer same day service treatments for wasp and hornet nests and will warranty the job. Allergic reactions to stings can be severe and potentially deadly. Please do not risk putting yourself or a loved one in danger and call a professional today to get treated.